Recovery heart rate is a pulse measurement that is taken immediately following intense exercise. Recovery heart rate is used in some fitness tests to evaluate the heart's ability to recover from exercise. The recovery pulse rate may be used to estimate an exerciser's fitness level. If you take group exercise classes or work out in a gym, you may have heard fitness trainers refer to recovery heart rate. In many spinning classes, for example, the instructor may ask you to take a recovery heart rate right after the hard part of the class is over. But you may not know the definition of recovery heart rate. Recovery heart rate is simply your pulse rate after exercise. Some fitness specialists refer to it as post-exercise heart rate. The pulse number is used for different reasons in different settings. In a fitness class, you might take a recovery heart rate in the 3-5 minutes after exercise to make sure that your heart is recovering properly. Many group exercise instructors will recommend that you bring the recovery pulse rate under 100 beats per minute before you get off your spin bike, for example, or move to the floor for stretching. Recovery heart rate is also used in popular fitness tests like the YMCA Submaximal Step Test. Recovery heart rate should not be used as a fitness measurement in people who are on medications that affect heart rate. Is Your Recovery Heart Rate Good? So how do you know if your recovery heart rate is normal? 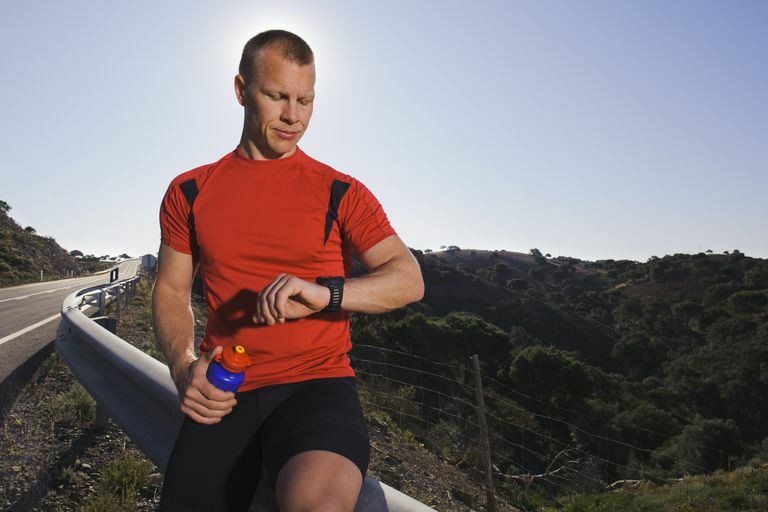 As a general rule, a lower recovery heart rate following vigorous exercise is better. In fitness settings (like an exercise class) trainers like to see your heart rate fall under 100 beats per minute in the first three minutes after exercise. In graded exercise tests, clinicians like to see a heart rate reduction of at least 12 beats per minute in the first minute following exercise if the patient is standing and a reduction of 22 beats per minute if the patient is sitting. There are also charts for recovery heart rate that are used to evaluate your fitness level. In the YMCA Submaximal Fitness Test, an exerciser steps up and down on a 12-inch box at a rate of 24 steps per minute. The test lasts for three minutes. Recovery heart rate is measured for one full minute immediately following the test. If your recovery heart rate is not as low as you'd like it to be, there are a few things you can do. First, you can simply wait a few days. If you are especially tired, if you'd had caffeine during the day or if you are not properly hydrated, your heart rate might be higher than normal. But if you notice that your post-exercise heart rate is typically higher, you may want to talk to your doctor. In many cases, your doctor may review your health history or recommend a further investigation to see why your heart rate is high. But your doctor may also simply recommend that you improve your level of fitness to train your heart to recover more effectively. The best way to begin if you've been sedentary is to begin an easy program of exercise. Many new exercisers are surprised to find out that they don't have to do hard-core training to see real results. In fact, easy exercise can even benefit trained exercisers. The key is to include easy exercise in a comprehensive program of movement that ultimately includes moderate and vigorous activity as well. If you measure your heart rate along the way, you will always know that you are training at the right intensity level. Recently, Polar a leader in wearable sports and fitness technology, released research data showing that athletes who use a heart rate-based training program were able to increase their level of fitness without increasing the volume of exercise. If you don't have endless hours to exercise, that's good news. The company developed a Polar Running Program that enables users to set a goal, and then build a customized and adaptive heart rate training plan to reach their goal. Polar's Running Index helps measure performance and progress. Data supports the fact that incorporating effective heart rate training results in better running efficiency and may ultimately improve health and decrease resting heart rate. Recovery heart rate is just one of the numbers that you might track to evaluate your health and fitness progress. Some people also measure their exercise heart rate and heart rate throughout the day. But how do you know if your numbers are healthy? What is a good heart rate? A normal heart rate is usually between 60 and 100 beats per minute. Generally, a lower heart rate (within that range) is considered to be better. There are many different factors that affect your heart rate. If yours is higher or lower than the norm throughout the day, it may be due to heat, caffeine consumption, genetic factors, emotions, body position, or medications. In general your daily heart rate will decrease as your fitness level improves and your cardiovascular system becomes more efficient. But that is not always the case with every exerciser. Your doctor can evaluate your health history and tell you if your heart rate is good and healthy. American Heart Association. All About Heart Rate (Pulse) January, 2018. Nate Brookreson. American College of Sports Medicine. ACSM Certification. "Using Heart Rate Monitoring For Personal Training." July 2015. American Council on Exercise. Physical Fitness Assessments. Health Coach Manual. 2013.